In-game model of a Waddle Doo in Kirby Star Allies. Waddle Doo (ワドルドゥ, Waddle Doo) is a common enemy from the Kirby series, being a stronger variety of the Waddle Dee. 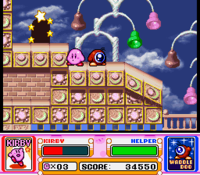 Waddle Doo as it appears in Kirby Super Star. 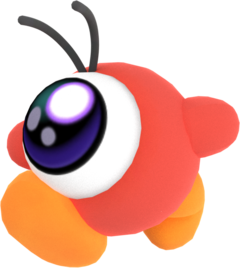 Waddle Doos debuted as enemies in Kirby's Dream Land and made several appearances in later games. They attack with an energy whip, exactly like the one they use in Smash, and give Kirby the Beam ability when swallowed. 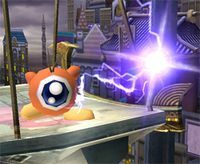 A Waddle Doo, using its beam whip in Brawl. Waddle Doos can be thrown by King Dedede's side special move attack, Waddle Dee Toss, and also appear in his Final Smash, the Waddle Dee Army. A Waddle Doo is the second most common enemy thrown when Waddle Dee Toss is used, with the most common being a Waddle Dee and the rarest being a Gordo. The Waddle Dee:Waddle Doo:Gordo ratio is 35:10:4, meaning a Waddle Doo has a 20.4% chance of being thrown. When the Waddle Doo's body hits a target, it will deal slash damage. After being thrown, a Waddle Doo will walk forward and periodically use its beam attack, damaging any opponent caught in the beam as much as 27%. The beam's hitbox belongs to King Dedede. After it has used its beam attack three times, it will disappear. When a Waddle Doo appears during the Waddle Dee Army, it falls and then runs across the stage in one direction, dealing electric damage (like its beam attack) to any opponent in its path for decent damage and knockback. Unlike in the Kirby games, Kirby gains no ability when he swallows a Waddle Doo. Hacking in the enemies file package of the Brawl disc has revealed data that appears to have been made for Waddle Doo, suggesting that it was planned to be included in the Subspace Emissary as an enemy. A creature identified by a single, unblinking eye. Like Waddle Dees, Waddle Doos roam about Dream Land and sometimes use parasols. Unlike their counterparts, though, they hate being approached--they'll fire a beam of energy at anyone who nears them, so don't think they're harmless like Waddle Dees. If Kirby swallows one, he copies the Beam ability and gains a jester's hat. Much like Waddle Dees, Waddle Doos are no longer part of King Dedede's moveset. However, they appear in the Smash Run mode of Super Smash Bros. for Nintendo 3DS as standard enemies, keeping their old behavior. 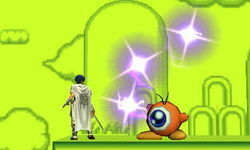 Waddle Doos appear as part of the Kirby-themed Vs. Enemy Team final battle. Two big eyelashes for one big eye? You're describing this beam-firing enemy from the Kirby series. This enemy may hop toward a fighter it spots and unleash an energy attack. The attack itself has a short range, but it can happen repeatedly and can stun. Unlike Waddle Dees, these guys will fight! Waddle Doo appears in Super Smash Bros. Ultimate as a Spirit. This page was last edited on February 12, 2019, at 19:52.